In 1972 the Lord began to draw together a small group of young women around Mother John Marie Stewart to begin formation as a religious community. The women followed the Disciple’s Holy Rule given to her by the Lord on January 22, 1972, which we now call the Disciple’s Founding Document. All of these women were involved in the Catholic Charismatic Renewal and shared a common vision of the Church as entering into a “New Pentecost” in fulfillment of the wisdom and directives of the Second Vatican Council (e.g, Lumen Gentium 4,7,13,20 and Perfectae Caritatis 8). In 1972 we traveled to Tokyo and Yokahama, Japan and to Mexico City and Monterrey, Mexico, witnessing to priests, religious, and lay people about the Charismatic Renewal and helping to form new charismatic prayer groups. During 1973-1975 we studied at the Graduate Theological Union in Berkeley, California, in the Jesuit Institute of Spirituality and Worship. During the first year we studied scripture and the Theology and Spirituality of the Catholic Charismatic Renewal, and the second year in Spiritual Direction. We received Certificates in Theological Studies. During this time we also received teaching and formation in the religious life from Fr. 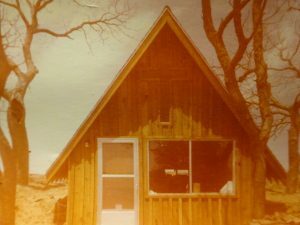 Bruno Barnhardt, prior of the Camaldolese Hermitage in Big Sur, California. We also gave the Life in the Spirit Seminars to several of the monks there. In 1975, at the invitation of Father Joseph James, we moved to Littlefield, Texas for a “cocoon year” of continuing formation, and to be near our apostolates in Monterrey, Mexico. We were then eight Sisters, and two lay people joined us for a time in 1976. During that year Mother John Marie attended the First International Catholic Charismatic Conference in Rome. We also continued our frequent journeys to Monterrey to minister to the growing prayer groups there. Also that year four of us made an Ignatian 30-day retreat based on the Spiritual Exercises of St. Ignatius. Two of us also attended the Institute on Contemporary Spirituality conducted by Jesuits from Spokane University and received teaching and experience in giving Ignatian Directed Retreats. 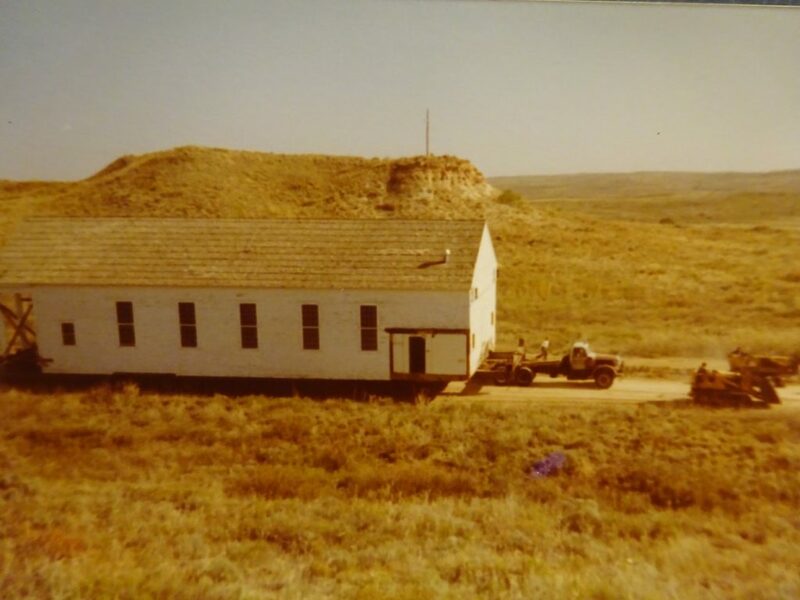 In 1977 our dear friends, Bill Brashears and his wife Jackie, were instrumental in our history by recommending to Bishop Lawrence DeFalco that land which was offered to the Amarillo Diocese by Mr. Oliver Bivins be given to our community. 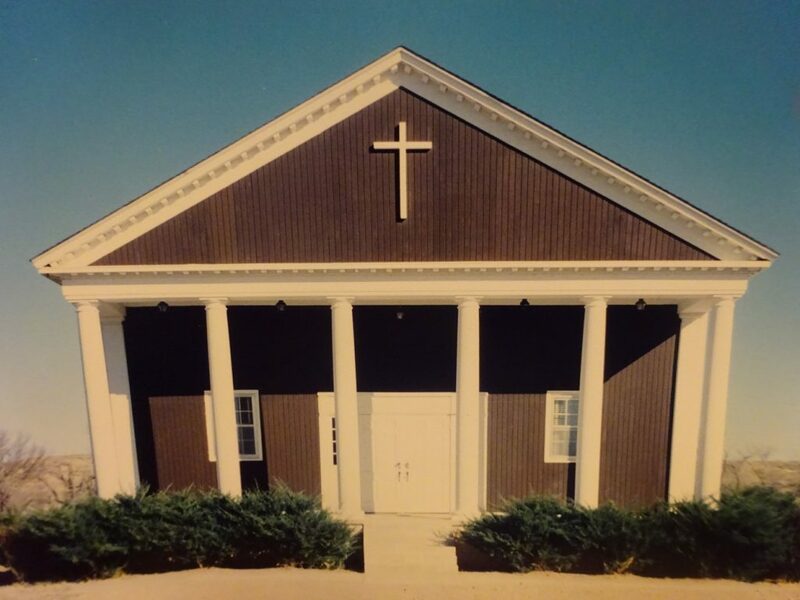 We are grateful to Mr. Bivins for his generous gift of 664 acres of beautiful pasture land near Channing, Texas where we have built Prayer Town Emmanuel. In 1977 we opened our first Mission House — Casa de Nazaret — in Monterrey, Mexico for ministry to the prayer groups and especially to the youth. Some of us also attended the first ecumenical charismatic conference in Kansas City, with 50,000 participants. In 1978 two of us made our first missionary journey to Poland for ministry with the Catholic Charismatic Renewal there. In 1979 Mother John Marie and a lay person went to India via Poland when Pope John Paul II came to Warsaw for the first time as Pope. Our journey to India was chiefly to consult the Bishop of Bombay about opening a Mission House there; however, the government had recently passed a law that would make that impossible. Also in 1979 Bishop DeFalco was in the process of making us a Pious Union, now called Public Association of the Faithful. After his death, Bishop Matthiesen became our next bishop. 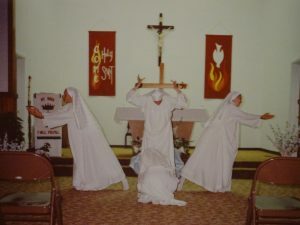 The Lord had told us from the beginning that “The light at the end of the tunnel will be your coming under the Franciscan banner.” In 1981 we began a year’s formation program in Franciscan Spirituality. 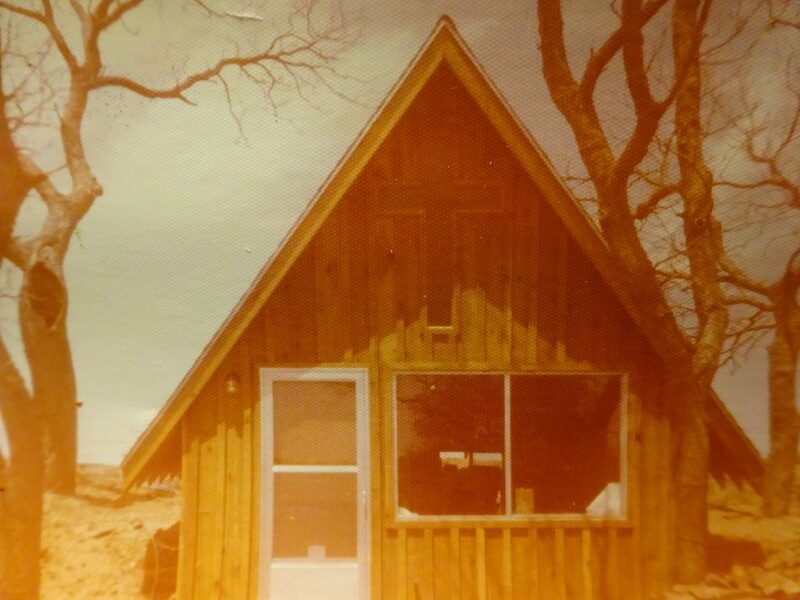 During the summer of 1981 a group of families joined us and became our Holy Family Community. 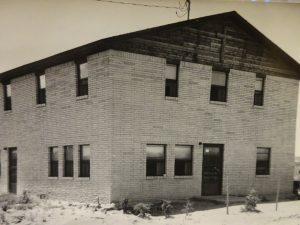 On August 31, 1983 we were established as a Secular Franciscan Fraternity, as a first step toward full religious status as Third Order Regular Franciscans. 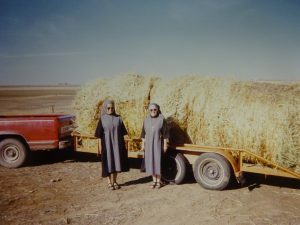 During 1982-1983 Sister Roberta Cuszak, OSF, and Sister Margaret Carney, OSF — both of whom had been on the International Rule Committee that had put together the new Franciscan Third Order Regular Rule– came to give us teaching on this Rule. On May 10, 1983 Bishop Matthiesen erected the Sisterhood as a Public Association of the Faithful. And our Holy Family Community became Secular Franciscans. Also in 1983 Holy Family Community and the Sisterhood put on our first Christmas play, The Birth of Emmanuel, with many friends attending. This became an annual event during the ’80s. That year we joined together for our first “Caravan of Jesus Joy”, traveling to major tourist areas during the 4th of July and Labor Day holidays to evangelize together with music, testimonies, and sometimes with sacred dance by the Sacred Dance Group of Boulder, Colorado. We did this in Old Town Plaza in Albuquerque, New Mexico; Estes Park, Colorado; Arch Park in St Louis, Missouri; and in local parks in the Amarillo, Texas area. 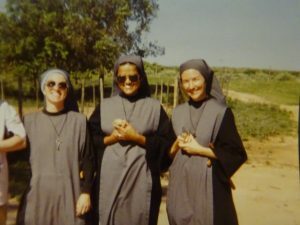 The Sisters also went to Yellowstone Park three times to do a similar evangelization. On Good Friday , 1984, the Sisters and the Holy Family Community put on the first of several Passion Plays, Living Stations of the Cross. 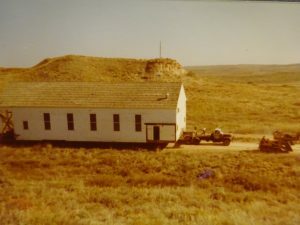 These always began at our St. Anthony’s Chapel and proceeded along the Holy Way, ending with the Crucifixion at Golgotha Hill. Afterwards in this same area we had our Good Friday Communion Service, often conducted by Bishop Matthiesen. Many people joined us for these Passion Plays. The Holy Family Community remained with us until 1990. In 1984 Mother John Marie attended the First International Catholic Charismatic Renewal Leaders Conference in Rome. This Conference was also attended by a number of people she had met on her missionary journeys to Mexico, India, and Poland. At an audience at the Vatican with Pope John Paul II, she was able to give him copies of our Disciple’s Holy Rule in English, Spanish, and Polish; “Some Principles for Families;” “Our Basic Vision of the Church;” our Community brochure; and a brief letter explaining who we are. Some weeks later she received a letter of encouragement from the Sacred Congregation for Religious and Secular Institutes. In 1985 we opened a Nazareth House in Lubbock, Texas for ministry to Texas Tech students. Our Sisters were working at Texas Tech University through evangelistic outreaches in the “Free Speech” area of the Campus and weekly prayer meetings with a number of students, some of whom became converts to the Catholic Church. In 1986 Mother John Marie was made a member of the National Advisory Committee for the National Service Committee of the Catholic Charismatic Renewal. 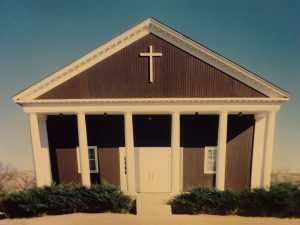 In 1989 we opened a Mission House in Miami, for ministry to the Charismatic Renewal in Florida. 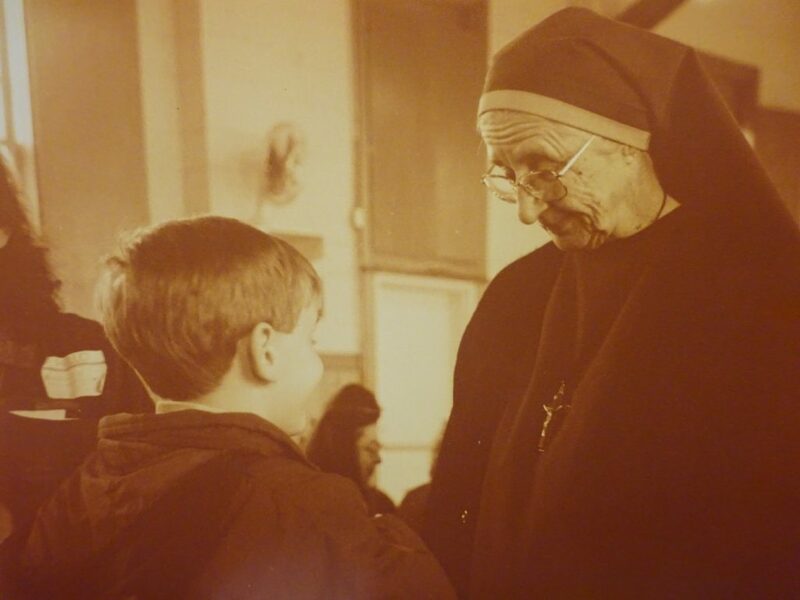 On April 7, 1991 Bishop Matthiesen erected our Community as a Religious Institute of Diocesan Right. The Sisters made their first public vows as Third Order Regular Franciscans, and the Bishop gave us the approved copy of our Constitutions. After Mass those in final vows held their first Chapter of Elections. Mother John Marie was elected as Superior General. In 1991 our music ministry Sisters made our first professionally recorded music tape of songs they had composed in English. Then in 1992 the Sisters recorded another music tape in English, and in 1993 one in Spanish. 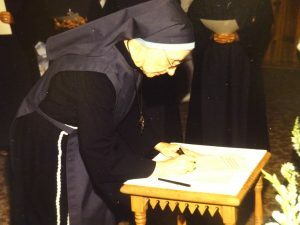 In 1992 the Council of Major Superiors of Women Religious was officially established, and Mother John Marie was elected to membership on the Governing Board.